Fresh from our friends at the First Multiple Listing Service (FMLS) February numbers are looking good; sales prices continue to rise! The Spring selling season has gotten off to a super start & we are expecting 2017 to be a very good year! 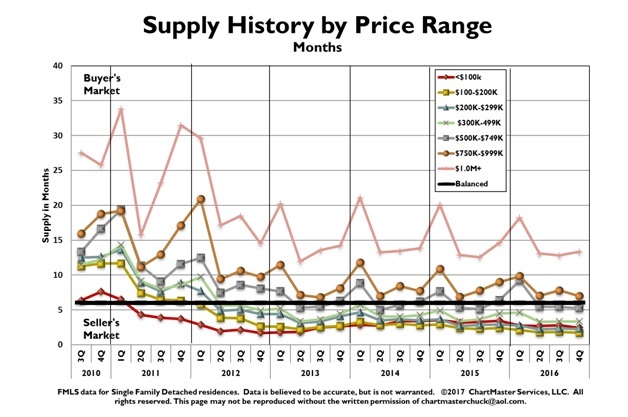 Inventory remains low with 3.1 months’ supply of listings, which means it’s still a seller’s market; especially in the <$500,000 price ranges. If you or someone you know is considering selling CONTACT ME TODAY to learn more about how you can take advantage of this market’s opportunities. Saint Patrick was actually born in Roman Britain at the end of the 4th century AD and taken to Ireland by slavers when he was a teenager. The exact place of his birth is debatable as some say Scotland and some say Wales but, either way, he’s Irish now. Saint Patrick is said to have banished the snakes from Ireland but in fact, Ireland never had any snakes as the weather was too miserable for the cold-blooded reptiles. The banished snakes were thought to be symbolic of the pagan druid priests with whom Patrick might have had a few issues to iron out. The global corporate-relations director of Guinness says 5.5 million pints of Guinness are sold on any given day, but this figure rises to an astounding 13 million on St. Patrick’s Day. IBIS World also reports that Saint Patrick’s Day 2012 brought in $245 million in beer sales. Due to strict laws on the curtailment of sales of alcohol on Holy Days in Ireland, from 1927 to 1961, the only place a thirsty Irish person could legally get a drink on Paddy’s day was at The Royal Dublin Dog Show. One TD was reported to complain that it was a grand occasion “except for all the dogs.” At the time, the church and state were worried that the Irish would drink too much on the day. Turns out they were right. Oh well. No matter what the price range, choosing the right Realtor® is crucial to getting your house sold too! You want a Realtor® who will help you exploit all the benefits of your house, give you ALL the info you need to make the right choices about price, staging & repairs AND who will properly market the listing. Experience, professionalism & negotiation expertise are extraordinarily important for you have the best representation possible. And you already know a Realtor® who possesses all of those qualities & offers concierge like service. If you or someone you know would like to take advantage of the opportunities presented by our market, contact me TODAY to get started.